It took me a minute to get my head around the overwhelming amount of….everything, before remembering to stop moving and take photos. 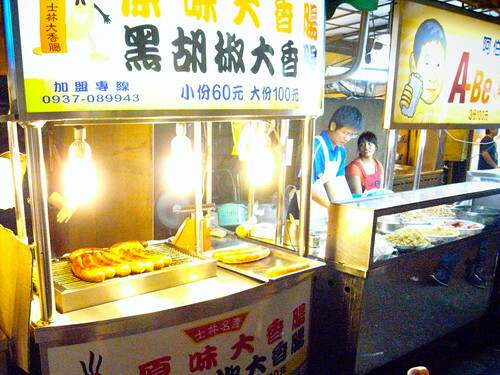 A group of food stalls serving buns, sausages, and skewered meats. 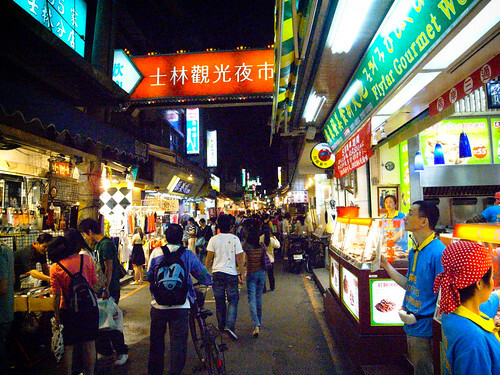 A very satisfying dinner could be had here just by picking up a few items as you casually stroll through the streets. 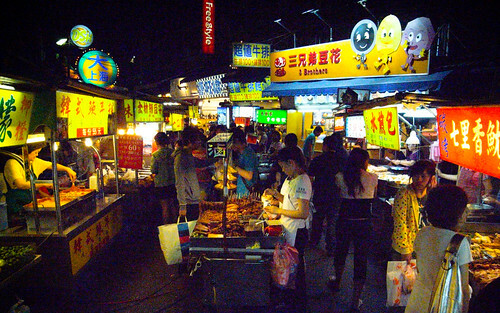 At the end of the night market is a large undercover warehouse that is dedicated for food. 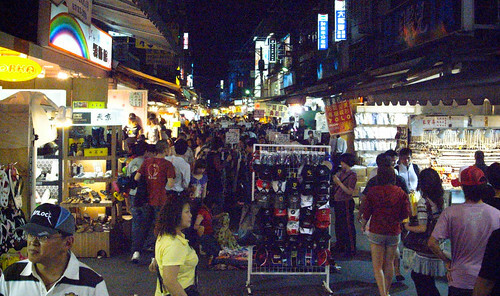 With such density and overlap in menu items, vendors usually have one or more persons responsible for inviting potential customers walking by, whom with all the choices and pretty lights cannot decide on which stall to stop at (e.g. me). The stall peddlers are polite and say things like “come have a seat”, “we have seats open” to invite you over. You leave only with regret that you were too full to try what they had to offer. 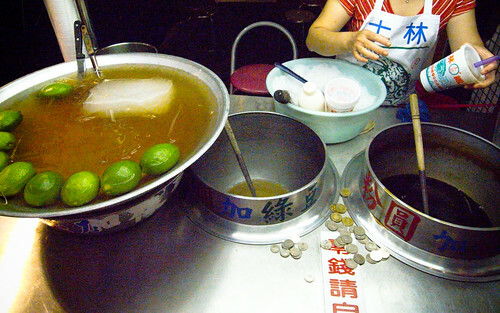 Snacks are highly affordable, costing about $1 (NT 30) for bubble tea or fresh fruit juice. A sizeable snack is also about a dollar on average. 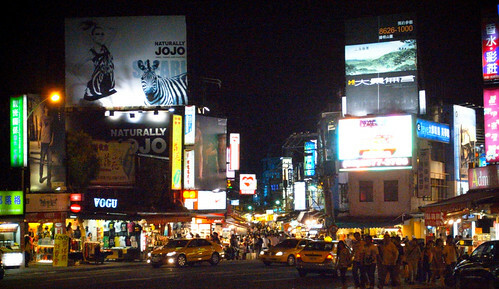 It’d be a challenge to spend over $10 (NT 300) and finish eating all the food that amount buys. Fried tempura (not the same as tempura you find in sushi places). 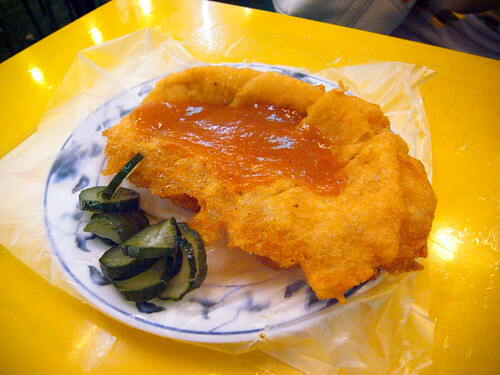 Extremely tasty batter wraps a thin cut of tempura served with sweet chili sauce and pickles. Sausages the size of a zucchini. I don’t know how these can be physically ingested in their entirety. Its enough meat to feed me for several days. Grass jelly pearl tea, or 青蛙下蛋 as its called, literally translates to “frog laid eggs”, referring to the appearance of the black tapioca balls in the brown tinged tea. Similar to bubble tea in Vancouver, but lighter with a hint of bitterness from the jelly. 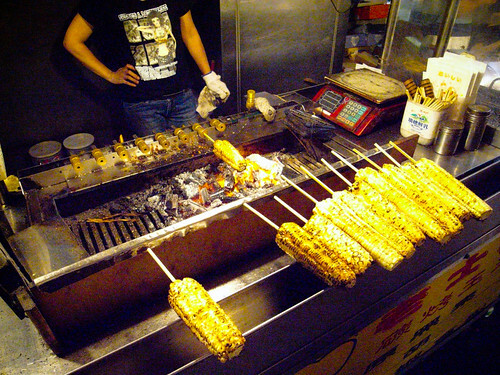 Roasted corn on the cob. Someone told me how these were prepared but I vaguely remember the details. Something to do with slow cooking over warm stone for hours before being displayed as you see here. 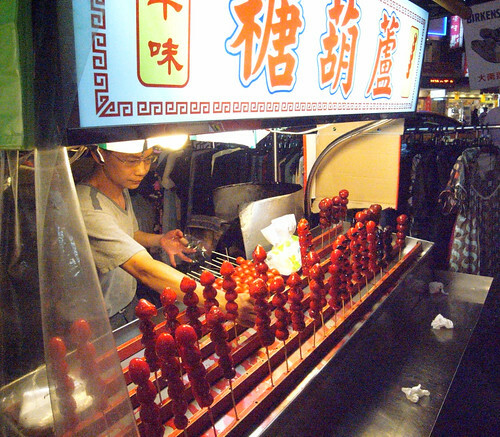 Once you pick the size you want, you pay by the weight and the skewer is attached to a brass spinner and brushed with a sweet and spicy sauce before a quick roasting. Result is a slightly firm textured corn not unlike tempura, and tasty as hell. Charcoal toasted buns. 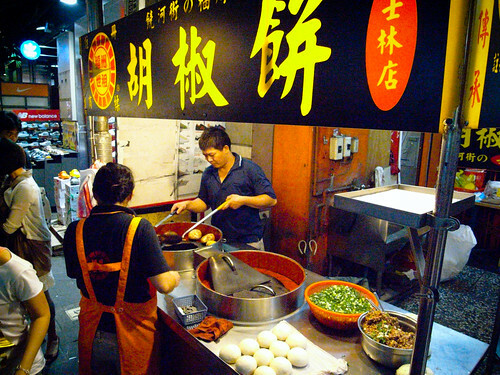 Though they look rather ordinary on the outside, these buns are filled with a tasty meat center. 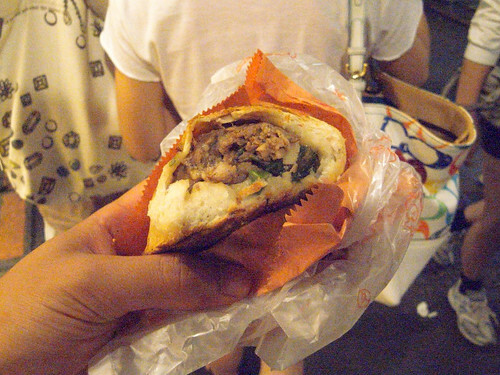 Think pepper steak in a bun. Shaved ice. 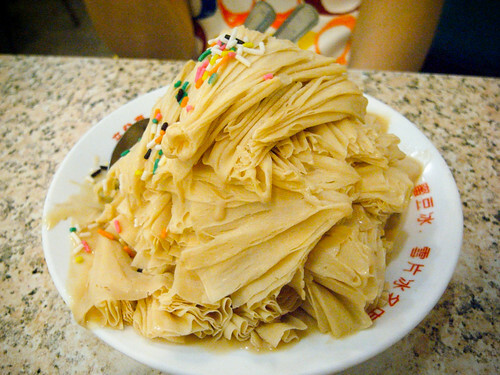 Though this looks like ice cream, its actually thin slices of ice shavings layered together. The texture is very unique, like cold flaky pastry that melts in your mouth. 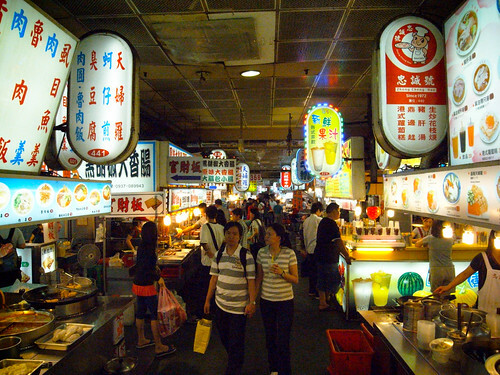 The Shilin market itself started in the early 1900’s and gradually evolved into what it is now, serving the increasingly affluent Taiwanese population with food and goods that are of high standard. 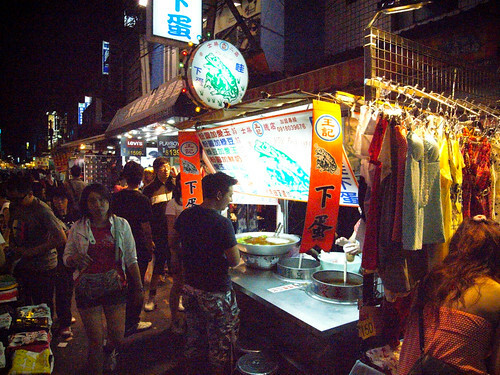 With the future of the local Richmond night market still in flux we just might have to travel overseas to get a taste of these Taiwanese favorites. 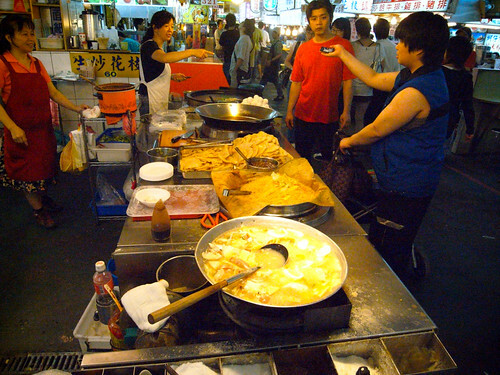 ive been in taiwan for 4 years & i really like their tempura. can you give me the recipe on how to make that tempura. thank you very much. Hi deer, nice to meet you here.